Numerous studies have shown that biventricular pacing (BVP) improves symptoms and exercise capacity in patients with congestive cardiac failure (CCF) and left bundle branch block (LBBB). The mechanism of symptomatic improvement has been attributed to changes in ventricular synchrony. However, the degree of asynchrony is not a good predictor of response.1,2 The aim of this study was to assess whether the presence of a restrictive mitral filling pattern, previously shown to be a marker for diastolic ventricular interaction (DVI) in patients with CCF,3 might identify a cohort of patients more likely to respond to BVP. We studied 23 consecutively referred patients (15 males/8 females), mean (SD) age 63.4 (12.8) years (range 40–83 years) in sinus rhythm with severe refractory heart failure (New York Heart Association (NYHA) III/IV), LBBB (QRS > 120 ms), and fractional shortening (FS) < 25% on maximal tolerated doses of medication, Clinical evaluation included history, ECG, M mode and two dimensional echocardiography before and six months after BVP. At six month follow up patients were classified as responders if there was an improvement in FS > 5% from baseline. Implantation of the biventricular system was successful in 19 patients (83%). Before implant, all patients were receiving either an angiotensin converting enzyme inhibitor or an angiotensin II blocker. All patients were receiving frusemide (furosemide) (mean (SD) dose was 119 (46) mg, range 40–180 mg). Six patients (32%) were on a β blocker, 9 (47%) were on spironolactone (25 (8) mg, 12.5–50 mg), and 12 (63%) were on digoxin (110 (36) μg, 62.5–250 μg). The optimised atrioventricular interval was 110 (19) ms (100–130 ms). There were no changes in medications after pacing. In the whole population there was an improvement in mean NYHA functional class from 3.4 (0.3) to 2.3 (0.5) (p = 0.001) after six months of BVP. QRS width did not change after pacing (165.0 (24.8) ms to 158.7 (35.2) ms, p = 0.14 after pacing). At follow up FS increased in 10 (53%) patients (responders) and decreased in 9 (47%) patients (non-responders). The mean increase in %FS in responders was 52 (41)% (6–110%) and the mean reduction in %FS in non-responders was 29 (15)% (6–50%). Response to pacing was independent of the aetiology of heart failure, baseline functional class, and medication. Improvements in NYHA class were seen in both responders and non-responders (3.5 (0.5) to 2.6 (0.7), p=0.004, and 3.3 (0.6) to 2.4 (0.5), p=0.004, respectively). There was no difference in mitral regurgitation score or sphericity index before or after pacing between responders and non-responders. Responders had a greater QRS duration at baseline than non-responders (174 (24.5) ms v 147 (20.6) ms, p = 0.05). There was a significant correlation between baseline QRS duration and change in %FS after pacing (r = 0.58, p = 0.028). Receiver operating characteristic (ROC) curves demonstrated that a QRS = 180 ms had a sensitivity of 66%, specificity of 75%, and a positive predictive value of 75% for determining improvements in %FS after BVP. There was no significant correlation between change in QRS duration and the change in %FS after pacing (p = 0.1, r = NS). 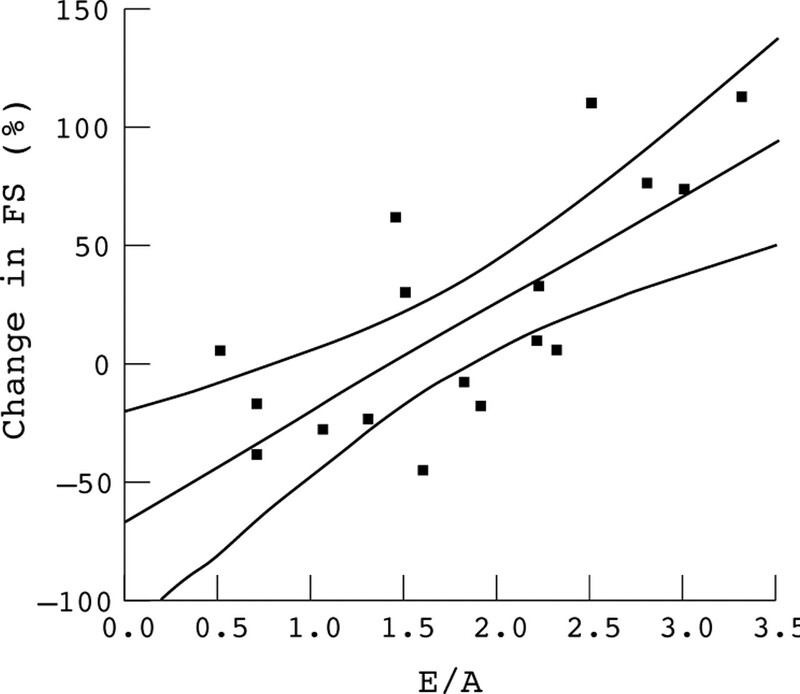 On transmitral Doppler responders had a higher E/A ratio at baseline than non-responders (2.1 v 1.3, p = 0.02). There was a correlation between baseline E/A ratio and improvements in %FS after pacing (r = 0.72, p < 0.001) (fig 1). In a bivariate analysis of baseline E/A ratio and QRS, only E/A ratio was significantly related to change in %FS after pacing. An E/A > 2.0 had a sensitivity of 70%, specificity of 100%, and a positive predictive value of 100% for predicting improvements in %FS after BVP. There was a significant reduction in E/A from 2.1 (0.8) to 1.4 (0.8) (p = 0.03) after pacing in responders, whereas E/A increased from 1.3 (0.4) to 1.6 (0.8) (p = 0.2) after pacing in non-responders (fig 1). Relation between baseline E/A and change in %FS after pacing. This study confirms that subjective improvements in symptoms occur in the majority of individuals who undergo BVP for congestive cardiac failure. Fractional shortening, however, improved in only 53% of individuals. This group was characterised by a broader QRS duration and higher E/A ratio at baseline. When baseline E/A ratio and QRS were considered together only E/A retained a strong correlation to improvement in %FS after pacing. This study suggests that simple Doppler parameters can identify a cohort of patients that are more likely to show improvements in systolic function after BVP. Although the clinical significance of these observations remains to be determined, we hypothesise that patients with restrictive filling pattern may have increased DVI and that BVP or left ventricular pacing may improve left ventricular systolic function by ameliorating DVI. A prospective study is required to assess the contribution of DVI to improvements in symptoms and left ventricular systolic function after BVP. Dr’s Thaman, Firoozi, and Hamid were supported by Junior Fellowship Grants from the British Heart Foundation, and Dr Murphy by the Irish Heart Foundation. Kass DA, Chen CH, Curry C, et al. Improved left ventricular mechanics from acute VDD pacing in patients with dilated cardiomyopathy and ventricular conduction delay. Circulation1999;99:1567–73. Auricchio A, Stellbrink C, Block M, et al. Effect of pacing and atrioventricular delay on acute systolic function of paced patients with congestive heart failure. Circulation1999;99:2993–3001. Atherton JJ, Moore TD, Thomson HL, et al. Restrictive left ventricular filling patterns are predictive of diastolic ventricular interaction in chronic heart failure. J Am Coll Cardiol1998;31:413–8. Blanc JJ, Etienne Y, Gilard M, et al. Evaluation of different ventricular pacing sites in patients with severe heart failure: results of acute haemodynamic study. Circulation1999;96:3273–7. Atherton J, Moore TD, Lele SS, et al. Diastolic ventricular interaction in chronic heart failure. Lancet1997;349:1720–4. Morris-Thurgood JA, Turner MS, Nightingale AK, et al. Pacing in heart failure: improved ventricular interaction in diastole rather than systolic re-synchronization. Europace2000;2:271–5. Morris-Thurgood JA, Frenneaux MP. Diastolic ventricular interaction and ventricular diastolic filling. Heart Fail Rev2000;5:307–23.